The Ultimate Louisiana Fishing Adventure for Anglers of All Ages! New Orleans Louisiana, Home of Jazz, Great Food, Southern Hospitality and one of the world's most popular fishing destinations. Louisiana is called "Sportsman's Paradise" and for good reason. Our rich ecosystem provides ideal habitats for some of the most sought after fresh and saltwater species of fish, birds, alligators and serves as a breeding ground for all. Come on down and get an amazing up close and personal look at Louisiana wildlife. Located just outside New Orleans, Delacroix Louisiana is one of, if not the best location for in-shore saltwater Redfish fishing. Want to catch some Redfish? The explosive hit on tackle followed by the immediate scream of the fishing reel, is the signature mark of the Red Drum species and here at Louisiana Fishing Charters we don't go fishing, we go catching! 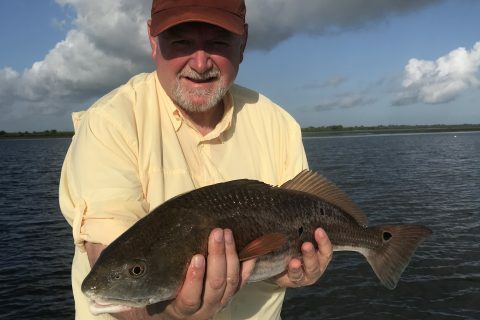 Our waterways are packed full of some of the most popular fresh and saltwater species including the hard fighting Redfish, Speckled trout, Sheephead and more. Our friendly, professional fishing guides will have you out on the water and filling up the ice chest in no-time! We are having a record year and just recently netted the Largest Redfish ever caught aboard one of our charter boats, the big bull redfish measured in at 42 inches weighing over 30 pounds! If you're ready for the ultimate outdoor fishing experience give us a call and book your trip today! Whether you are interested in staying at one of our on-site fishing lodges us or just fishing for the day, you may be asking yourself, how much for this incredible Louisiana fishing adventure? Well how do you put a value on an such an unforgettable Louisiana fishing trip? Smack-dab in the middle of "Sportsman's Paradise". Lasting memories will be made here and possibly talked about for years to come. Permanent bonds between fellow anglers and the opportunity to go toe-to-toe with some of the largest Redfish you have ever seen! Well........ we did and for current fishing prices follow the link below. We also offer inshore fishing charters customized to corporate groups. We are experts at accommodating large groups for meetings, team building exercises, award trips, and client entertainment. This means everything from transportation to boarding at the lodge. After the purchase of the fishing license, which we can also help with, we can take care of the rest. Your clients and employees are just as important to us as they are to you. This means you won’t have a crew yelling or barking orders at your guests or showing anything less than perfect professionalism. Come on down to Delacroix. Looking to catch Redfish huh? The explosive hit on tackle followed by the immediate scream of the fishing reel, is the signature mark of the Red Drum species. However the Louisiana Redfish by far has become a category of it's own. Big Bull Redfish are abundant throughout our waterways and into the Gulf of Mexico. 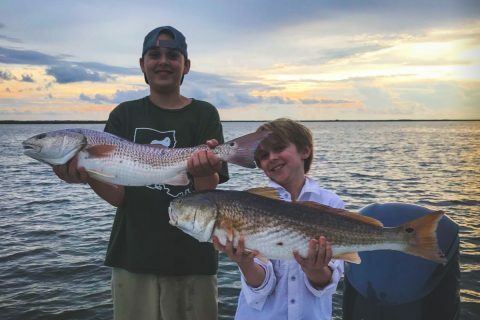 What makes fishing for Redfish so exciting is it can be enjoyed by anglers of all ages! Get Ready, To Enjoy Louisiana Fishing at it's Best! 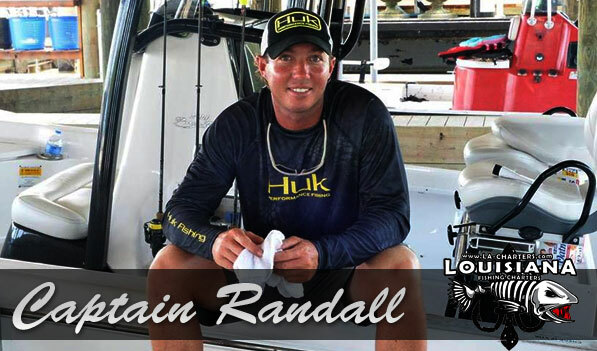 Welcome to Louisiana Fishing Charters, Your Premier Saltwater Fishing Experience. 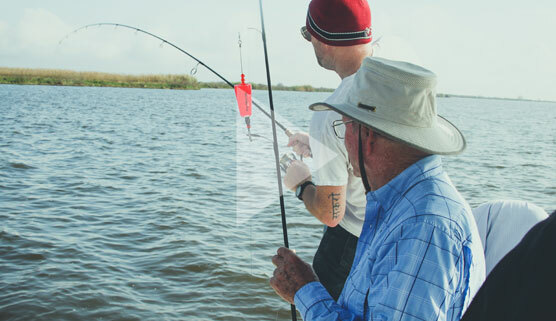 We are located just 30 minutes from downtown New Orleans and provide you a fishing adventure unlike any other. We are a full service fishing charter, we can provide everything your group needs from food to lodging. The comfort of our sportsmen resort accommodates groups of all sizes. Young or old, family fishing trips or just getting out on the water with friends, we provide an experience you'll never forget. 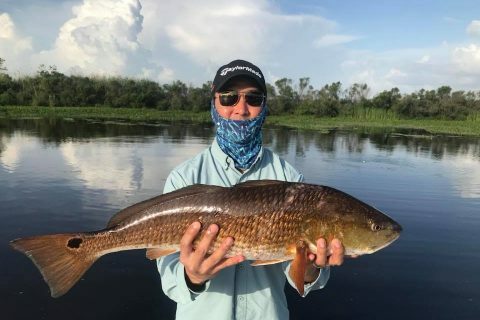 Louisiana Redfish Guides know how to find the fish! If you’re looking for an unforgettable New Orleans fishing adventure, you can’t get any better than a fishing trip to Delacroix Louisiana. Big Bull Redfish, Speckled Trout, Sheephead, Black Drum are just a few of the salt-water species Louisiana has to offer. Our friendly, knowledgeable captains will put you on the fish and have your reels screaming in no-time! Staying in New Orleans? We’ll pick you up!We’re just a short drive from the french quarter, and offer full accommodations as well!